The back side of the rocket firing Boba Fett is the more interesting side. Notice that there's no date stamped on the leg. The detail comes out well in this photograph and you can see that there are only a few coils in the spring resulting in a missile that doesn't shoot much more than about 24 vertical inches. Although this is the most prevalent version of this prototype, another stage of prototyping was done to create a figure that would not fire accidentally. This J-slot version (as collectors have named it) made the mechanism safer but part of the backpack could be broken causing a shard of plastic which presented a "sharp" hazard. It was this sharp that ultimately doomed the firing feature. 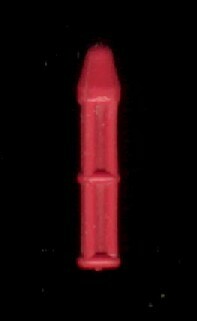 The rocket that accompanies this style of figure has 4 ribs running lengthwise but the design was changed to 8 ribs when the figure was changed to the J-slot version. The 8-rib missile design carried forth to the production action figure.